A meeting on Archaeoastronomy dedicated to the 1400th anniversary of Anania Shirakatsi will take place on September 25-28, 2012 in the Byurakan Astrophysical Observatory (BAO), Armenia. The meeting is being organized jointly by BAO, Institute of History, Institute of Archaeology and Ethnography, and Matenadaran. Talks on the Armenian rock art, ancient calendars, astronomical terminology, ancient observatories and astronomical instruments, records of astronomical events by ancient Armenians, Anania Shirakatsi’s heritage, etc. will be presented by astronomers, historians and archaeologists. Discussions on organizations of the archaeoastronomy matters in Armenia will be held. 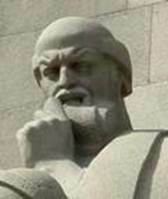 Anania Shirakatsi (612-685) was the greatest Armenian scientist of the middle ages: philosopher, mathematician, astronomer, geographer, chronologist, the founder of the exact and natural sciences in Armenia. He in fact was the founder of the astronomy in Armenia. He supported the spherical hypothesis of the Earth, suggested a correct interpretation of the Milky Way, and explained the Solar and Lunar eclipses. Shirakatsi had a number of chronological works; chronological calculations, tables, he has written several books. Most of the Armenian names of the constellations and stars used nowadays also come from Shirakatsi.